In order to configure Spring Framework to perform JDBC operations, we will use a very important template class provided by Spring Framework which allows us to perform JDBC operations, named - JDBCTemplate. A JdbcTemplate property named jdbcTemplate used to initiate object of JdbcTemplate class, used to perform JDBC operations using Spring. This JdbcTemplate property will be assigned a value by the Spring Container using its respective setter methods, when the CustomerDAO bean is created by it using the configuration xml file(to be created in the upcoming section). String query = "create table customer "
Reads XML to create the CustomerDAO bean named CustomerDAOBean and initiate its property jdbcTemplate with a value by calling its setter methods i.e. setJDBCTemplate(). Using CustomerDAOBean calls the method of CustomerDAO class i.e. addCustomer(int id, string name, string address, int age), to add a customer to the database table. Using CustomerDAOBean calls the method of CustomerDAO class i.e. deleteCustomer(int id), to delete a customer record by using its id value. In this file, we have configured a CustomerDAO bean with a unique id and with its String property named tableName and JdbcTemplate property named jdbcTemplate. These properties will be assigned a value by the Spring Container using their respective setter methods, when the CustomerDAO bean is created by it using the configuration xml file. For example - ref="jdbcTemplateBean" refers to a JdbcTemplate bean with id having a similar value - jdbcTemplateBean, declared in this configuration file, to initiate the JdbcTemplate object. This JdbcTemplate bean has a datasource property which refers to a data source implementation class declared in this configuration file. 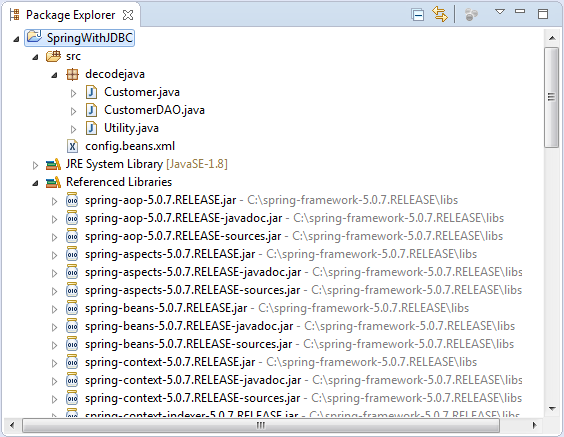 Project Folder - SpringWithJDBC is the name of our Project and it is a top-level directory. And, this concludes configuring Spring with JDBC.